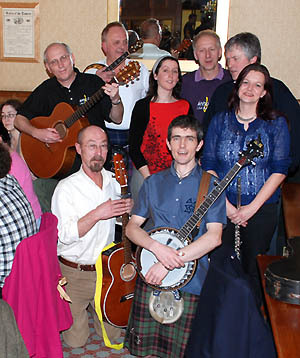 This Friday (1st March) we have another Borders Spotlight show at the Oak Room, with the Humble Scribes providing the entertainment. Humble Scribes are Kevin Wilson and Ronnie Templeman who both hail from North Shields, near the mouth of the River Tyne. They started school together at the age of five and have remained friends ever since. It was during their late teens that they first started playing and writing songs together, nurturing dreams to be songwriters for a living. But along came the girls and forced them into slavery where they have remained for 20 + years. 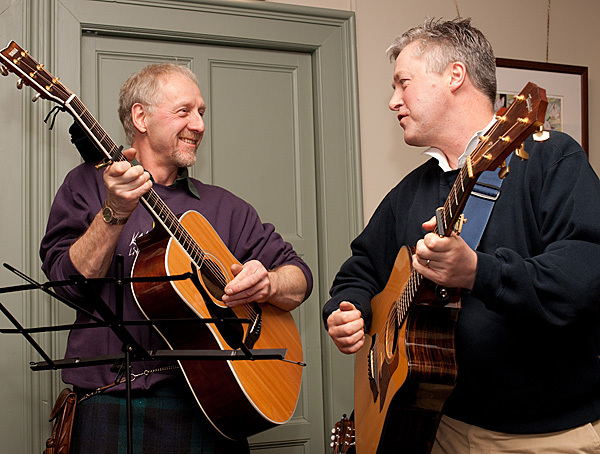 In 2008 they threw off the shackles and started playing and writing again, frequenting Denholm folk club on a regular basis and producing their first album “In Cahoots”. Kev and Ronnie both enjoy making music just for fun, and they hope this comes across in the songs. 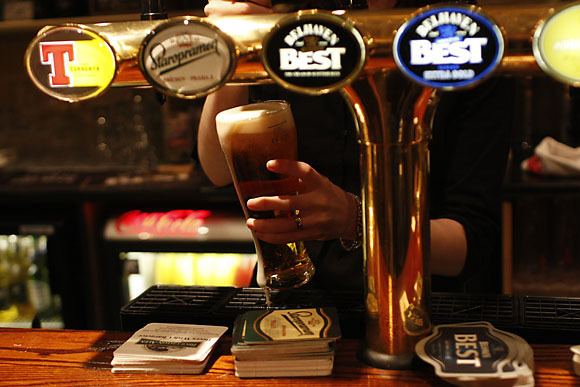 The evening kicks off at 8 pm with floor spots. 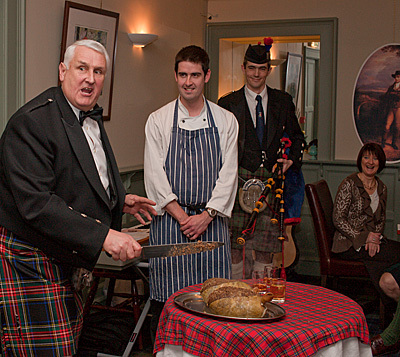 The club held its second ever Burns Night at the Cobbles on Sunday January 25th 2009. The chair and organiser for this year was Ian Croall, following in the illustrious footsteps of Roger Platfoot who staged the first event in 2008. Aw, Gavin, ye could hae smiled fae the camera! 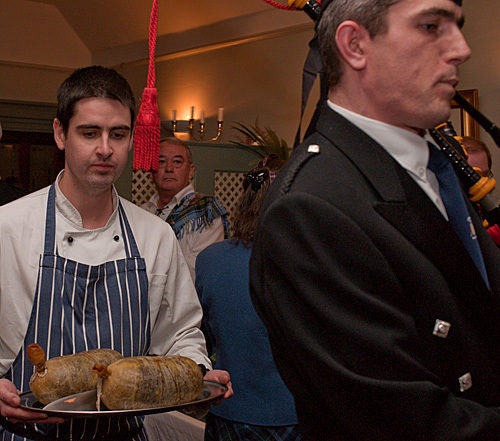 The haggis aywise looks miserable, it kens whit’s coming! Eric slashed with a single firm stroke from well on high and nearly sent the reekin’ whatsit all round the function room! 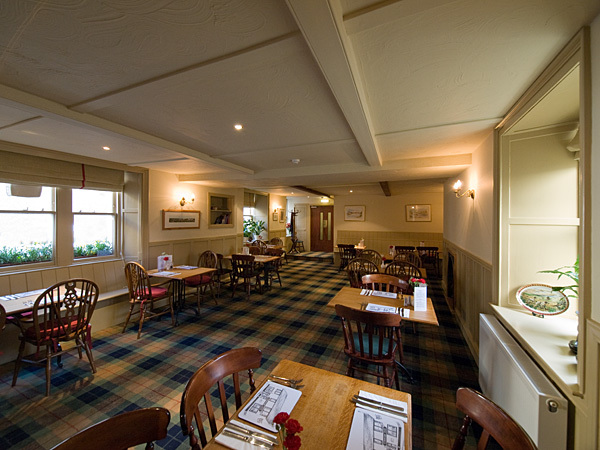 Ian said he had been known to harle the ceiling of dining rooms with haggis, in a single stroke. Still, a Sabatier works wonders where a dirk would hardly suffice! This is just a table shot. Well, why not? 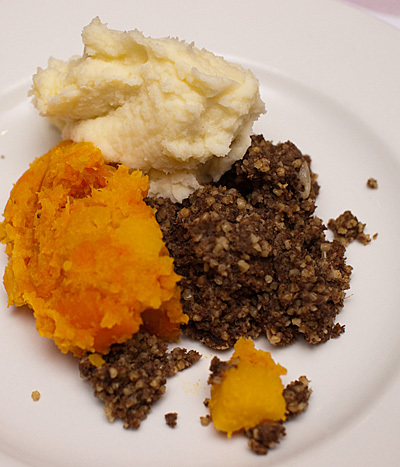 The Burns Night bucked the recession by selling out in advance. 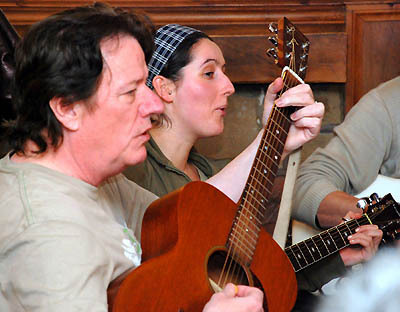 Our thanks to Ian Croall for masterminding the exercise, to all those who got up and sang songs they had never sung before, and to Annika and Gavin for a fitting repast. 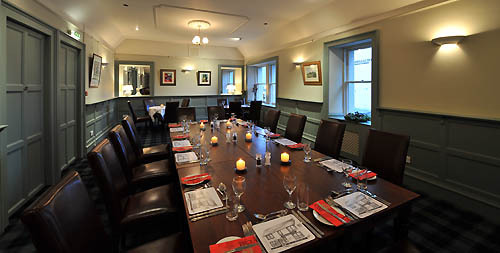 The Club has continued to hold regular Burns suppers or nights. In 2016, this short video was made – upstairs at the Cobbles. 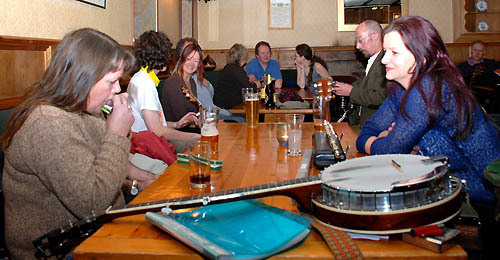 Before the Cobbles was remodelled in February 2008, James Shepherd shot some pictures of the typical weekly Friday night sessions. Most of these showed slack-jawed yokels drooling over their guitars with eyes closed, because that’s what happens when you shoot singers and musicians after a couple of pints and mid-song. 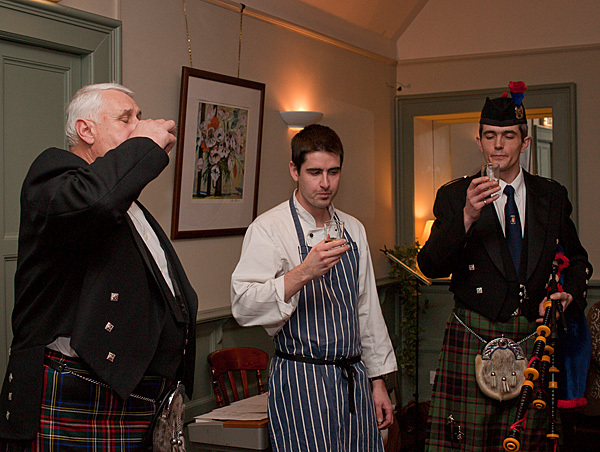 However, a few of us managed to stay reasonably sober-looking and composed. 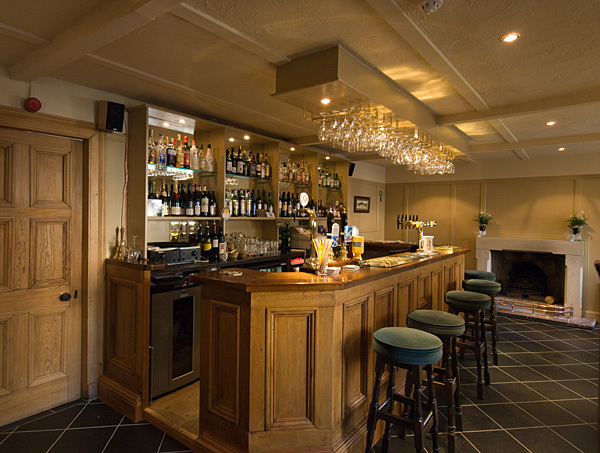 The Cobbles has always been a warm and friendly pub and we hope the new bar looks as well stocked as this, and and as easy to get to. Heather plays moothie while Helen listens intently. Darren’s banjo resonates all on its own. 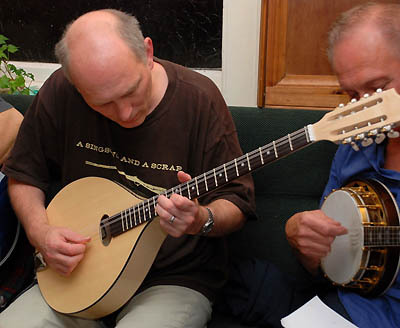 It isn’t all guitars and David is concentrating on trying to turn a bouzouki into a mandolin, which probably means Dave Mullen was singing a Waterboys song or Ron Hastings was doing a bit of R.E.M. David’s wearing an Acoustic Chumbawamba tour T-shirt celebrating English rebel songs of the last 400 years. 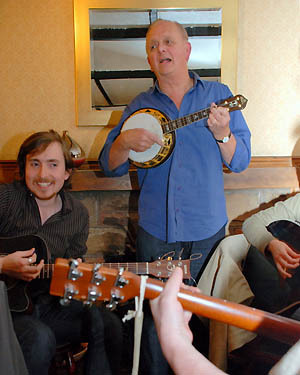 Roger blasts away on the banjo ukelele. 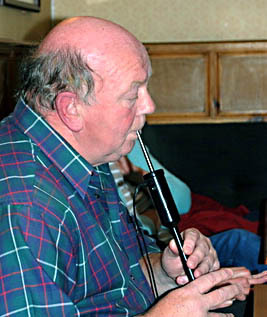 Ian Croall used to be in insurance, which you probably need when your hands and mouth complete the circuit for a set of Deger electronic midi smallpipes. The controllable volume makes the electronic animal far more session-friendly than the cauld wind blown original. 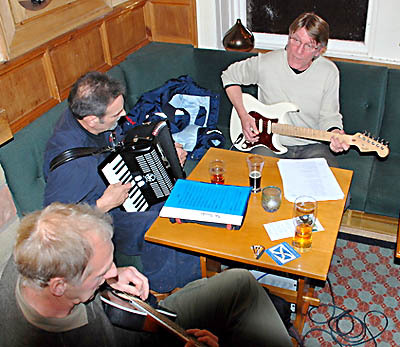 If anyone can compete with the sheer volume of a squeezebox at close range, it must be Mr Peter Fry on electric guitar and unamplified (rarely needed!) vocals. 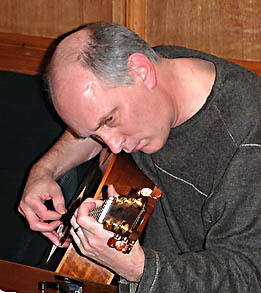 Pet Shop Pete reinforces the strings in the face of rampant free reed virtuosity. 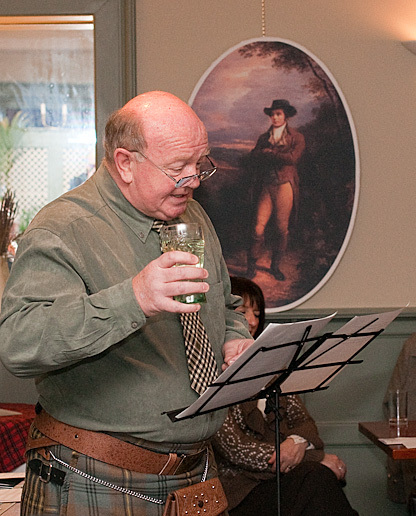 Ron Hastings knows that any real performer will stand up to be seen and heard. He doesn’t realise that the rest us can’t find the frets with one hand and the strings with the other unless we are sitting down hunched up over a guitar. Which is not the best way to get the music out there! 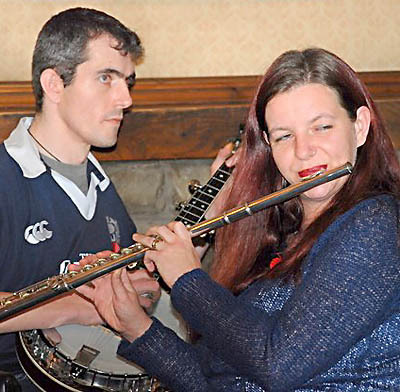 Helen and Darren prove that a gently handled banjo can be the perfect accompaniment to flute. 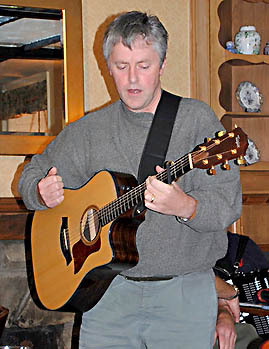 And Roger proves that the songs of George Formby are timeless in their appeal, and always able to raise the roof. Scattered round the room, it’s not that easy to get a photo of more than two or three Kelso Friday night session regulars at a time, so for this shot everyone posed – and for once, there was a moment of peace and quiet in the Cobbles!